Roma dei mercatini is an innovative tour in Rome that invites you to explore the best city markets, rich of history and traditions. During this audio travel, we will lead and help you to find the best price solutions. Out tour begins at the ancient market “Testaccio”, Porta Portese, and then leads you to the Market of Circo Massimo and Viale Tiziano. 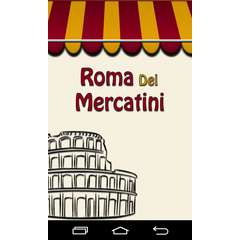 If you’d like to get more information on various counters, you can download the app “Roma dei mercatini”. We wish you a nice stay in Rome greeting you with our slogan “Keep Calm and Romadeimercatini”. Whoever read the commentary is obviously not English mother tongue, possibly a German/Dutch speaker, and would have benefited greatly from an intensive course of elocution lessons... Her delivery is often incomprehensible in its German sounding quality, the tonic accent invariably in the wrong place, the soft "r" irritating (it has no place in English) and I could continue. Altogether very disappointing, and the two stars are actually generous. Pertinent replies welcome, in English or Italian.